Eclectic is an understatement when you look at Chez Jose. I have passed by this place for many years and seen its amazing ocean motif painted on the outside and the mannequin legs dangling from the balcony a floor above. Usually when you see the outside you wonder: “what is going on here?” Once you go inside you see a cozy little place with a Brazilian and Angolan flag on the ceiling as well as small tables and chairs spread around able to seat around 20 people. The place is definitely small and in the winter it can get cold if people open the door too often, so try to get a spot far from the door. The washroom is also tiny so if you’re a tall person: don’t sit down or you will bump your knees (if you’re curious just check it out). The menu is not your classic breakfast menu and initially I was a little worried when I saw salads and soups on the it, but when you get into it you will see there are some good morning eats and at the same time a nice offering of some vegetarian/vegan options. Salads come in 2 sizes; large and small and range in price from ($4.00 -$7.00); Soups have 4 choices (3.50-$5.00). There is an empanada section ($3.00) and empanada with combo section ($4.50-$7.00). 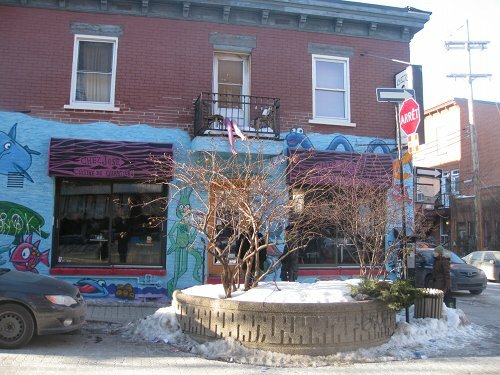 Chez Jose is known for its sandwiches and you get some great choices with 7 options which are either $4.00 or $5.00. You can also add a salad for $2.00 extra. The fresh fruit juices came as a small ($5.00) and large ($6.00) format and you get some great ingredients like mango, blueberries, grenadine and coconut milk to name a few. Lastly, there are the salty ($8.00) and sweet ($8.00) sections. The salty section had an omelette or crepe and you can choose your topping such as ham, onions, spinach, asparagus, mushroom, tuna & olive, smoked turkey, feta, cheddar, and chorizo. The sweet section comes with options such as lemon and chocolate, pear and chocolate, fruit mix, dulce de leche, apple and cinnamon, plain and chocolate. You can also get French toast ($7.00), eggs and cream ($7.00), and Portuguese or Mexican omelette ($9.00). Before we chowed down, we started up with some drinks: my friend and I had the psychedelic blast ($5.00) which is fruit drink made of: oranges, mango, strawberries, and blueberries. There was also the Yuniko, which is: oranges, pineapples, strawberries and mangos. Chez Jose is really well known for their sandwiches and although a breakfast sandwich does not exactly scream brunch it is starting to pop up more and more around Montreal and if done correctly can actually be quite tasty. So, knowing that they make a good sandwich, I had to try it. 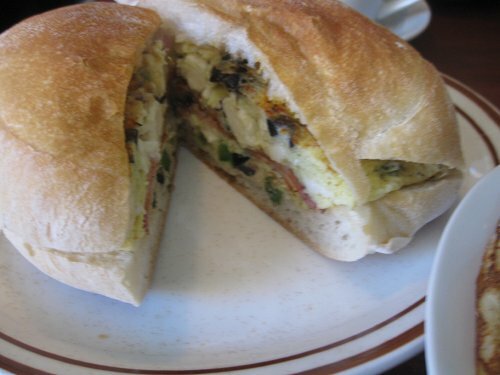 I had the omelette sandwich ($5.00) which was very filling and I liked the fact that I could choose 3 types of fillings. In this case, I had olives, chorizo and feta. The bread was perfect since it was filling, a little fluffy and did not leave crumbs on me. I firmly believe that the right bread needs to used to pull off a good breakfast sandwich. 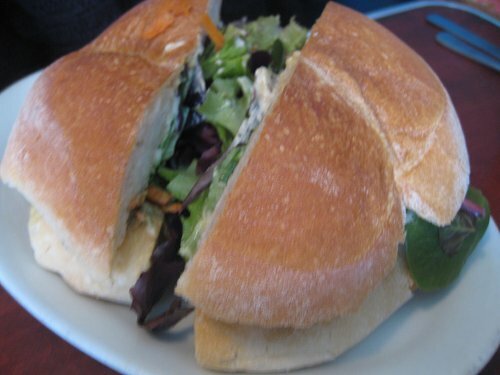 My friend had the vegetarian pate sandwich ($5.00), which came filled with avocado, cucumber, cheese, lettuce and a vegetarian pate. This sandwich was AMAZING and 100% fully vegetarian. It also had a hint of spiciness in it but not the hot kind of spicy, more like the savoury kind of spicy. This would be hands down one of the best breakfast sandwiches I have had in a long time and one of the best vegetarian menu items I have had as well. The taste of this dish really delivered and did not disappoint in any way, shape or form. 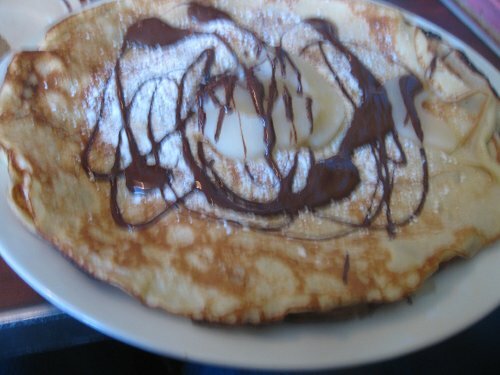 Lastly, I had the pear and chocolate crepe ($7.00). The crepe was quite large and the pairing of the chocolate and warm pears is a great idea and works well; although, the taste could have been better as it seemed that something was missing. Maybe for the pears to stand out more was to have more of them. I think with some minor tweaking could make this dish be so much better. Our waitress was really nice, she was thorough in her explanation of the menu, and did come by to check up on us often. They did not have regular drip coffee so I could not judge the speed of refills. There are some great vegetarian options and even some vegan options if you choose the salads. Chez Jose is very vegetarian friendly and you have choice. The options are tasty and filling and you do not feel limited by the options even though it is a small menu. Just checked out Chez Jose as it is close to my house. Everything is lovely, and as described, but they no longer have a debit machine, nor bottomless coffee. In fact, there is no filter coffee at all–just Americanos.